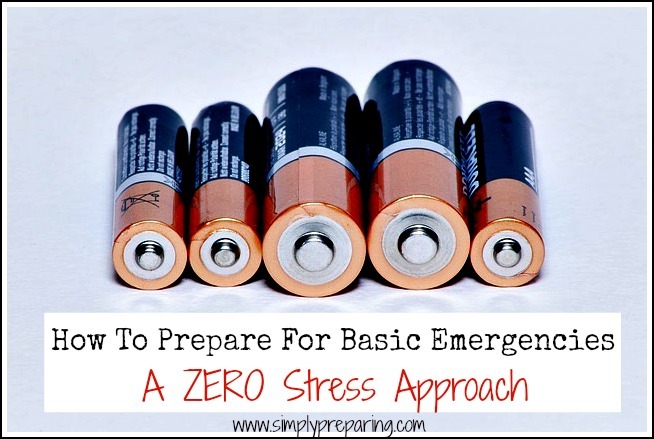 Prepping for basic emergencies doesn’t have to be overwhelming. It doesn’t have to be a huge expense. I work with many people who immediately get that dear in the headlights look when the topic is preparing families for emergencies. 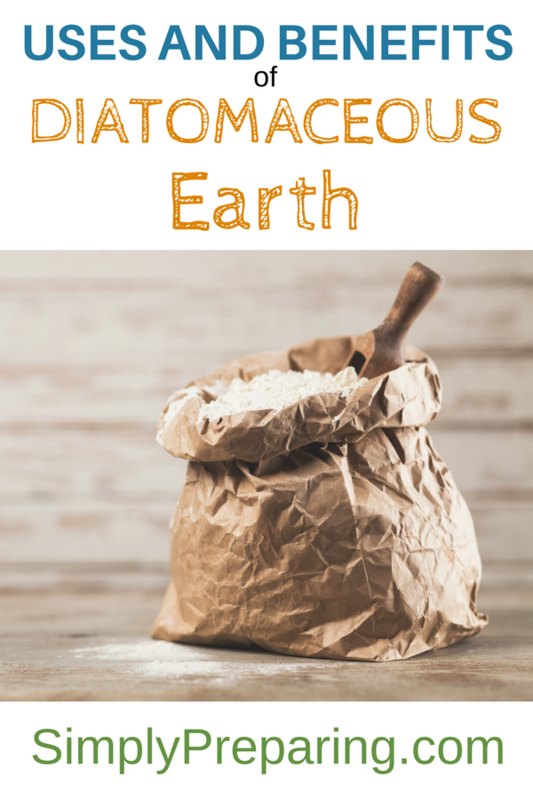 Prepping for basic emergencies can be as easy as taking a trip to your local grocery or big box store. Nobody likes to be stuck in the dark. These items are inexpensive and will make getting through an emergency a much safer experience. Water is your friend, boys and girls. Make sure you have 1 gallon of water per person per day. More if you are hoping to flush toilets, or brush your teeth. I’d suggest a LifeStraw water filter that can easily fit into a backpack. Ready to eat, shelf stable foods. Quick and easy is the name of the game. Peanut butter. Crackers. Those ready to eat packets of tuna. Again, things you can pick up a little at a time each time you make a grocery run. As a BIG fan of Freeze Dried Meals in emergency situations, the Mountain House Just in Case Essential Bucket is one of my favorites. Unlike many other buckets of this kind, Mountain House has put together a trio that even my kids will eat. You’ll need a way to heat water to add to these meals. Don’t forget the matches! Don’t be stuck spraying your sweet patoot clean with a honey bear filled with cold water unless the apocalypse really is in full swing. Until then stock up on the TP. After Hurricane Harvey, toilet paper was listed as one of the 6 most sought after items. Hurricane survivors underestimated how much toilet paper they needed to make it through the aftermath. 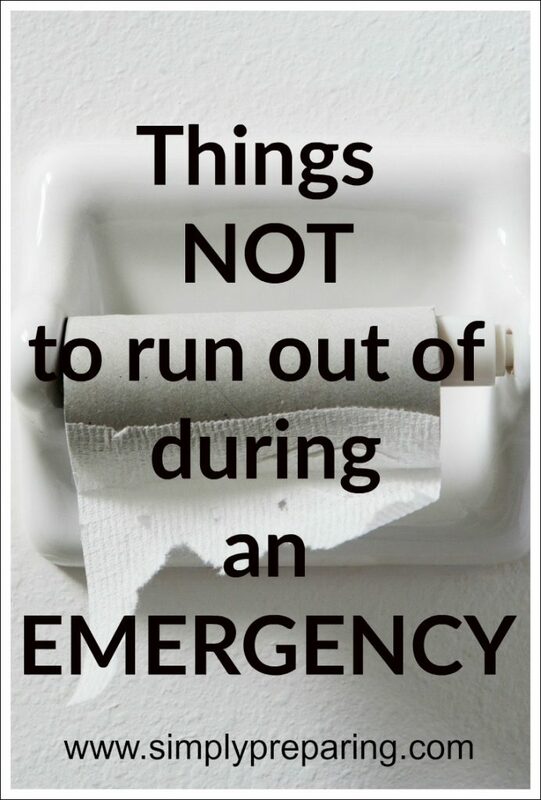 Toilet paper is used every day and when it runs out, things can get disgusting……quickly. Duct tape is truly the stuff miracles are made of. In case you need some inspiration check out our post on this glorious product. Line a 5 gallon bucket with a contractor bag for an emergency potty. Cover broken or blown out windows after an earthquake. Here are more ways to use these versatile bags. Aspirins. Allergy Medication. Cough Syrup. Prescription medications. I have a week’s worth of medications sorted by day in one of these handy little travel pill organizers. In an emergency you want to make things as simple as possible. Chances are you’re not a doctor, nor do you play one on T.V. You aren’t going to be performing a tracheotomy or needing to crack someone’s chest to massage their heart. 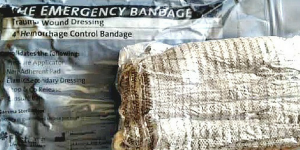 A basic First Aid Kit will serve you well. There is a good chance that during or after an emergency event the air quality may be less than stellar. N95 Respiratory Masks will protect you from dust, allergens and other forms of air pollution. We’ve broken down the respiratory mask code to help you decide which mask will best protect your family. Have some cash on hand, with small bills being best. 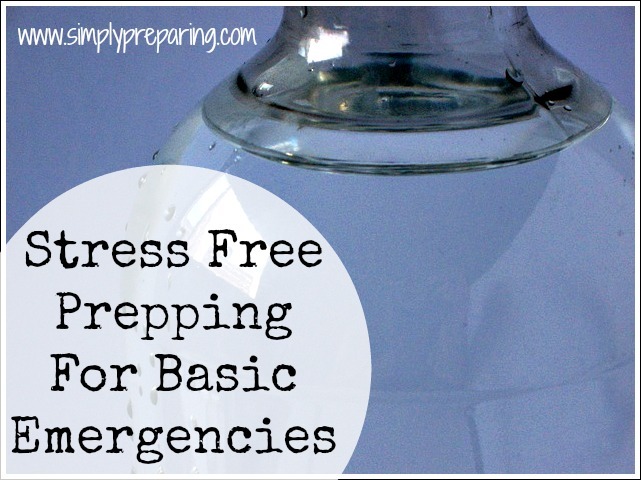 Make copies of all important papers and include them in your basic emergency kit. 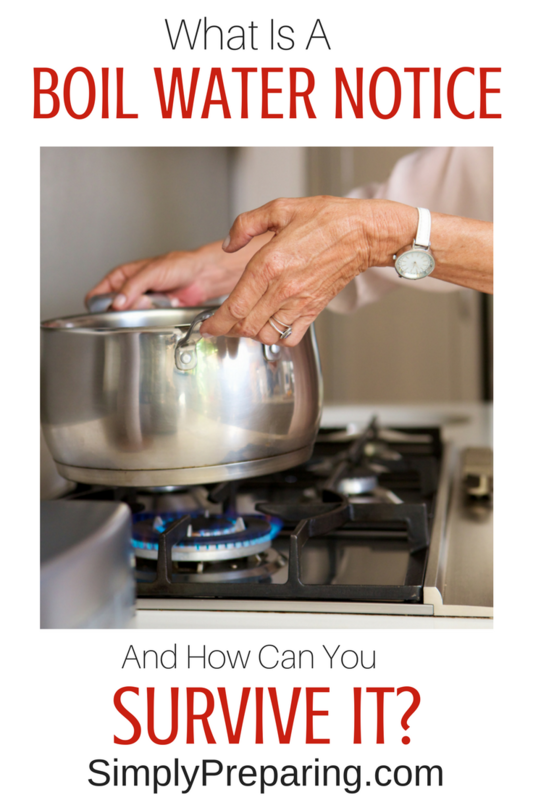 Can you take preparedness to a higher level? Of course! Most people start with the basics, get the bug, so to say, and then continue to grow their preparedness goals. The point is that you don’t have to jump onto the Expert Level to make sure your family can make it through a rough time. And every thing listed above can be purchased either at your grocery store or a big box store, on sale, and often with coupons. Start simply. Pick up a few items each time you get paid. 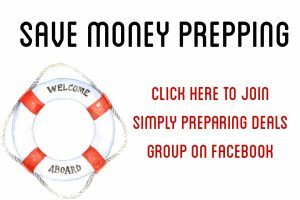 Sell some of your stuff that you are no longer using, and put that money towards a prepping goal. Put your foundation in place and then work to meet your personal preparedness goals. Self sufficiency is a mind set, an every day way of thinking. It’s a journey to a simpler, less worry filled life. Where are YOU in your emergency preparedness goals? How can I help you achieve those goals? As a mom, I really liked all the tips you got here! Thanks for this! These are SUPER great tips! Even when you are low on space (such as being in a smaller apartment) you can still find little spots to store these much needed (and frequently forgotten) preparedness items! These are great tips. We aim for having a month’s worth of food for each person in our house (4 of us) at all times. Great, practical tips here. You should always be prepared! I agree. I think it’s less stressful to buy “just a little extra” every time you go shopping. That way you don’t have to carry home a bunch of stuff all at once and there’s always a spare of whatever you need around. Ideally, you’d buy most of what you’d need for the rest of your life sooner rather than later just for economic reasons–prices are going to keep going up, I suspect. Then there’s inflation. Thanks a lot for the advice! These posts are always full of great information. Going to keep an eye out for those contractor bags.